Starting later this month, we will release changes to the NeonCRM navigation that will help you save time and get more done. 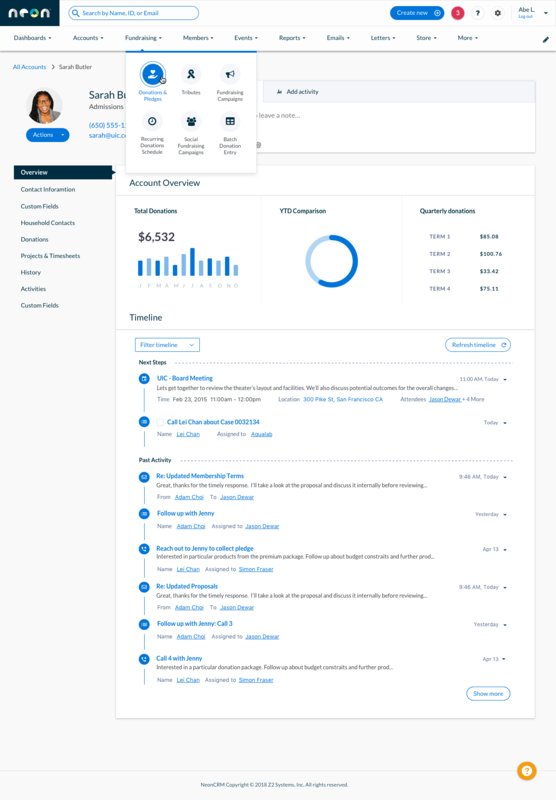 This marks the start of a user experience (UX) redesign that will update the look and feel across the product in the months ahead — all with the goal of making NeonCRM work better for you. After nearly 15 years serving nonprofits, our team could not be prouder that we’ve become one of the most trusted, comprehensive nonprofit software solutions for thousands of organizations. As NeonCRM has grown in users, our product has grown in functionality, too. You’ve seen new features and improvements rolled out each month — and in the past year or so, those updates have included major releases that have extended functionality in big ways. Now, we’re going to make sure all those features are as easy to use as possible. We’re investing in a thorough redesign of our product’s core navigation, look, and feel with 3 specific goals: making it easier, faster, and more pleasurable to get your work done every day. According to Nonprofit Hub, only 5% of nonprofits say they use data in every decision that they make. We know that your data plays a huge role in achieving your mission. But in order for you to use that data to make smart decisions, it has to be as easy to find and leverage as possible. Nonprofit staff turnover is at an all-time high, with nearly 1 in 5 nonprofit employees expected to voluntarily leave his or her job this year. Teaching new staff, co-workers, and volunteers how to use your software can be a time-consuming and costly process. We’re building simple interfaces and in-product learning modules to make it easier for new users to get up and running. A full year of looking into user research and UX best practices has informed our strategy, with a focus on standardizing components and interactions across NeonCRM. Our goal is to make things look, feel, and work in a way that you’ve come to expect from the wider world of web and software design. Our team has created a streamlined design that will be standardized across NeonCRM, and continue to be built upon in the years to come. Existing pages and interactions will be updated on a rolling schedule to minimize disruption — and create a consistent, simple experience across the product. After these updates, we’ll move on to other areas of NeonCRM — ensuring a consistent look, feel, and functionality for you across the system. We’ll give you ample notice before we make any changes — so keep an eye out for future announcements. All of us at NeonCRM are so excited about these updates, and we can’t wait to share them with you!